Apex Tree Experts has been removing and grinding stumps in the Pacific Northwest since 2005. Stumps are removed to eliminate possible infectious diseases which endanger healthy trees. By removing stumps we also reduce pest problems like carpenter ants and termites. Besides removing an unsightly stump we make room for new plantings. After removal of a tree, the resulting stump should be removed. Although, we try to leave only the smallest of stumps, there is always a stump for almost any sized tree, bush or shrub. 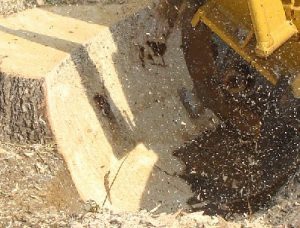 The most effective and efficient means of removing the stump is with a stump grinder. Stump grinders are mobile. They grind away at your stump until it is just below grade. Grinding is better than the use of chemicals. The resulting wood grindings or chips can be used for mulch or compost. This will help in re-planting or re-seeding. Here is a video of stump grinding in action. After an old plum tree was cut down, a stump was left measuring 12-14 inches across. The stump grinder made short work of the stump and roots going down about six to eight inches into the ground. Call Apex Tree Experts at (253) 227-9775 for details. Here is another video of stump grinding in action. This stump was from a 65-year-old cedar was cut down. This grinding took longer than the old plub tree did, but still it was a lot faster than removing it by hand. The job was done quickley and economically from a spread of surface roots to cutting down the stump below grade and leaving nothing but sawdust on top. From removal to grinding call Apex Tree Experts at (253) 227-9775 for details. As part of our clean up we can also feed limbs and branches into a chipping machine, which adds to the volume of chips to be used for mulch. Wood chips are the natural way to return yard waste into the soil. 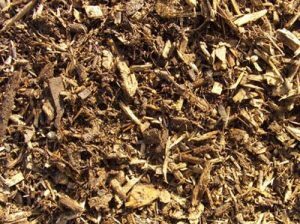 The wood grindings and wood chips can be used for mulch or compost, or ground cover. If you have stumps in your yard from from previous tree removals, which were never removed we can grind them away for you as well. Our services are there to help you. Also if you have other brush and shrubs you would like removed and run through our chipper, we are happy to accomodate those services as well. Find out more information about how we can help you by calling (253) 227-9775.